Can’t get the tickets of your movies at Pavilion or Berjaya Times Square? You can now try GSC’s new outlet at Quill City Mall in Jalan Sultan Ismail, Kuala Lumpur (opposite Sheraton Imperial Hotel). This 10-screen multiplex has a seating capacity of 1,751, (including 20 wheelchair space) with a THX hall equipped with Dolby Atmos “3D” audio sound system. There’s also a new concept “projection room-less” auditorium in Hall 7 that features a retractable digital projector mounted to the auditorium ceiling. From December 18th onwards, moviegoers at this new cinema will get Buy 1 Free 1 vouchers upon ticket purchase at the counters, and free Heaven & Earth can drinks with every GSC Combo 3 purchased. All of these offers are while stocks last. 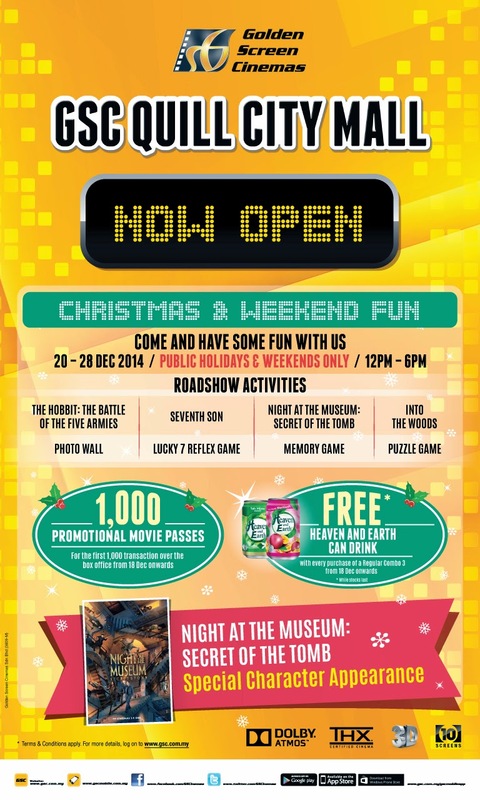 There will also be activities on weekends and public holidays between 20 – 28 December whereby the public can participate in Night at the Museum 3: Secret of the Tomb Memory Game, The Hobbit: The Battle of The Five Armies photo wall activity, Seventh Son Lucky 7 Reflex games and Into the Woods Puzzle Game, featuring the characters from the movies with loads of prizes to be won. Five more new GSC locations are planned to be opened next year – GSC NU Sentral Kuala Lumpur, GSC IOI City Mall Putrajaya, GSC Klang Parade, GSC Ipoh Parade, GSC Aman Central Alor Setar and in 2016 – GSC Bintulu Times Square, Sarawak.